Many of us, without even realizing it, are dominated by fear. We might be aware of some of our fears—perhaps we are afraid of public speaking, of financial hardship, or of losing a loved one. 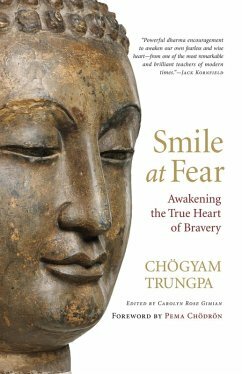 Chögyam Trungpa shows us that most of us suffer from a far more pervasive fearfulness: fear of ourselves. We feel ashamed and embarrassed to look at our feelings or acknowledge our styles of thinking and acting; we don't want to face the reality of our moment-to-moment experience. It is this fear that keeps us trapped in cycles of suffering, despair, and distress. Chögyam Trungpa offers us a vision of moving beyond fear to discover the innate bravery, trust, and delight in life that lies at the core of our being. Drawing on the Shambhala Buddhist teachings, he explains how we can each become a spiritual warrior: a person who faces each moment of life with openness and fearlessness. "The ultimate definition of bravery is not being afraid of who you are," writes Chögyam Trungpa. In this book he offers the insights and strategies to claim victory over fear.